Tumor necrosis factor (TNF) is an inflammatory cytokine that acts as a signaling molecule in our immune system. 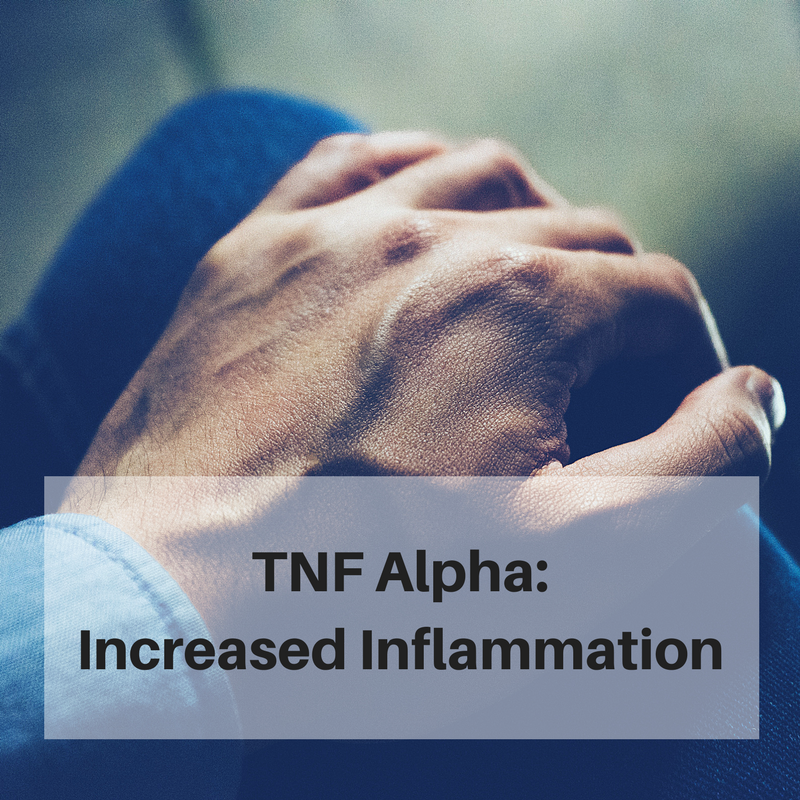 In an acute inflammatory situation, TNF-alpha plays an essential role in protecting us. The problem with TNF-alpha comes when we have chronically elevated levels, leading to an increased risk of rheumatoid arthritis, heart disease, or autoimmune conditions. There are several genetic variants linked to naturally higher levels of TNF-alpha. Below are just some of the variants, along with some of the studies on them. rs1800629 (also known as -308) – The A allele generally has higher TNF-alpha, more likely to have problems with chronic inflammation. Diet: “Carriers of -308 G/G promoter variant of TNF-alpha gene have a better metabolic response than -308 GA obese with a high protein” and lower carb diet. rs361525 (also known as -238) Carriers of the A allele generally have higher TNF -alpha levels [study]. Again, not all studies show this, but by far, the majority of studies point to the A allele being at a higher risk for inflammatory conditions such as an increased risk of psoriasis or COPD. rs1799964 (also known as -1031) C allele carriers have higher TNF-Alpha levels[study], which puts them at an increased risk for inflammatory conditions, such as of IBD, increased risk of congenital cytomegalovirus, and higher risk of acute coronary syndrome. rs1799724 (also known as -857) T is the minor allele and is associated with higher TNF-alpha levels [study] and increased risk of severe RSV and Alzheimer’s disease. Rosmarinic acid (found in rosemary, basil, holy basil, lemon balm, and perilla oil) is a natural TNF-alpha inhibitor. In addition to adding herbs to your food, holy basil can be found in a tea (called Tulsi tea) or supplement. Examine.com has good information on rosmarinic acid. Aged garlic extract was shown in a study to decrease TNF-alpha levels by 35% in a mouse study and other studies. You can find aged black garlic at grocery stores, and it is available as a supplement if you don’t like the taste of aged garlic. Glycine has been shown to reduce TNF-alpha and inflammation. Glycine is an amino acid that is abundant in bone broth, collagen, and gelatin. My favorite way to increase my intake of gelatin is to dissolve it in my coffee each morning. Here is one that I usually use: Zint Beef Gelatin. Or you could try a hydrolyzed collagen that dissolves in hot or cold liquids. Low magnesium levels may play a role in higher TNF-alpha levels. Magnesium sulfate, in conjunction with thyroid medication, in hypothyroid rats, decreased TNF-alpha levels. Another study showed that magnesium threonate reduced TNF-alpha levels in an Alzheimer’s model. TNF-α modulates expression of the circadian clock gene Per2 in rheumatoid synovial cells.